, we talked about the momentum we’re seeing in mobile search advertising. We also announced a new mobile search ad product: Custom Search Ads for Mobile Sites. We wanted to give some more details about this new format and how you can begin using it to grow your business on mobile. As increasing numbers of users access websites using their mobile phones, more and more desktop publishers are bringing their businesses to the mobile web. You may have seen our recent initiative, ‘GoMo’, which is designed to help publishers and businesses take their site mobile. Currently, publishers can monetize their mobile sites using AdSense for Mobile Content. We wanted to also help mobile web publishers earn from their search traffic, and so with Custom Search Ads for Mobile Sites, we're bringing the power of search ads to the world of the mobile web. Mobile websites that provide a search option will be able to show ads related to search queries. Users will see ads relevant to what they're searching for, and publishers will open up a new revenue stream from their mobile properties. Many mobile websites contain custom search functions that ask users to search within a variety of specific parameters. With Custom Search Ads for Mobile Sites, these parameters are taken into account to help determine what ad is shown and deliver the most relevant ad for a user's query. For example, in the image below you can see that someone using Trulia, a real estate search engine, is searching for properties in Washington, DC, and the ads match this query. 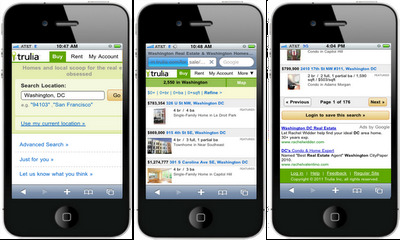 Trulia.com implemented Custom Search Ads on their mobile site. When a user scrolls through their search results (in this case, for property in Washington, DC), they are served both search results and Custom Search Ads relevant to their query. Moreover, mobile web publishers can customize the look and feel of the ads to complement their site’s design and layout. Some of the customization options include changing the font size, background color and gradient. Custom Search ads can also be integrated into mobile apps with the same customization features and options. We're currently accepting applications from publishers to use Custom Search Ads for Mobile Sites. If you're a mobile publisher or app developer interested in this product, apply now on the Custom Search Ads page. Recently on the Official Google Blog, we talked about the momentum we’re seeing in mobile search advertising. We also announced a new mobile search ad product: Custom Search Ads for Mobile Sites. We wanted to give some more details about this new format and how you can begin using it to grow your business on mobile.